Meeta confronts Ashok that she feels insecure around him and once upon a time, she used to feel like a baby in his arms, but know he acts immature and arrogant. She continues crying emotionally. Ashok realizes his mistake. On the other side, Minnie selects dress for Babita while Babita is engrasped in thoughts. She asks if she is nervous about her first day of job. Babita says she is thinking same, but…Minnie asks what.. Babita walks in front of mirror and says she sometimes they have experienced so much in the last few months, her life was just bounded to household chores and family, now she confidently is ready to take up job. Minnie says she took Hanuman’s words of coach and player seriously, Hanuman is always not right and he was wrong just today. Babita says even Hanuman is a human and can make mistakes, she should not be harsh on Hanuman. Minnie says even she should not be harsh on herself. Hanuman returns home silently and asks Laala to go and check if mother and daughter are there. Laala returns and says they are not. Hanuman relaxes on chair and says he will not apologize Babita as it is not his mistake. Minnie enters with Babita and Nayeem bi and insists him to apologize her. Hanuman gets adamant. Their nok jhok starts. Minnie says Hanuman is coward to accept his mistake. Nayeem bi says Hanuman is adamant since childhood. Babita takes Minnie away. Laala tells Hanuman that one challenge has not yet finished, another one started. Ashok reminisces all the recent incidents where his family feels ashamed of him, Minnie hating him, him spoiling Babita’s life, etc.. Mita walks in. Ashok gets emotional and says he is very bad as she hates him and even his family hates; like his father told, he is bhasmasur who is destroying himself, but he wants to change and live with Mita as he loves her a lot. He continues expressing his feelings emotionally. Mita also gets emotional and accepts her love. At night, Minnie is busy polishing Babita’s sandals and blabbering. Hanuman walks in and says sorry for disturbing them, he has Minnie’s complaint and says Minnie is daring and brave, but she does not respect elders. Babita scolds Minnie and says she does not listen to anyone. Hanuman says if she listens, she cannot speak truth then; she dared to tell Hanuman is coward, if someone else had told him, he would have broken her face, anyways Bapu/Gandhiji told one needs courage to apologize, he is not afraid of big gangsters, but he is afraid of apologizing, he is gaining courage to apologize Babita with folded hands and realized it was his misunderstanding. Minie smiles. Precap: Minnie stops Babita from applying sindoor and asks when she has divorced papaji, why she is holding past still. 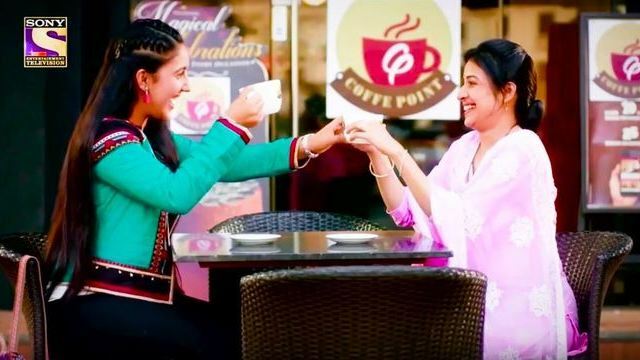 The post Patiala Babes 26th February 2019 Written Episode Update: Hanuman Apologizes Babita appeared first on Telly Updates.